The change in government on 22nd May seems to have occasioned a very different response from inside Thailand compared with the world outside. The international media were quick to condemn the coup, which to some extent can be understood. After all, the term coup d’état literally means a ‘state hit’ and to see the uniformed heads of the military sat at a table announcing they are in charge evokes images of Central America during the Cold War. Of course, things aren’t always what they seem in Thailand, however. After all, the government was run mainly by the military, or military appointed politicians, for around 60 years, until 1992. Then, in 2006, there was another coup ousting Thaksin Shinawatra from power. 10) Economic plans will be based on transparency. Thus, the country is used to coups and, given the political paralysis which seriously threatened the economy in late 2013 and early 2014, many people within Thailand feel it was necessary. So much so that when martial law was declared two days before the coup, a Suan Dusit Rajabhat University poll found that of 1,264 men polled nationwide, 76% agreed with the move.1 Read into that what you will. Whilst the international media is drawn towards the men in uniform, prime minister General Prayuth Chan-ocha has appointed a mix of free-market and interventionist economic advisors. In early June, the government announced a framework of ten economic priorities. 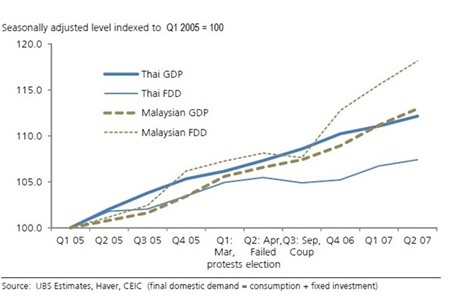 The coup may have delivered the coup de grâce to the political turmoil, which not only paralysed public policy but also saw international investors accelerating their already significant sell off of Thai assets. Foreign SET sales since January 2012 wiped out the balance of overall foreign purchases made in the previous 6 ½ years. This year alone2, foreign investors have sold nearly THB 33 billion of equities on the SET more than they have purchased. The note did exercise caution, however, it questioned where growth would come from and how the government would help this. It said that it expected a policy rate cut by the Bank of Thailand and that, with elections not likely for another year the long run depends on the military government’s actions, the boost to growth is likely to come from private and state enterprise in the short term. One of the Thai economy’s recent weaknesses has been a low level of demand, not helped by the termination of government-funded projects such as the first-buyer car scheme. The UBS report suggests that, because people didn’t spend in Q1 2014, a certain amount of demand is ‘pent up’. With that and its analysis on exports and the potential effect of government policy, UBS’s baseline scenario is that around 60% of domestic demand could be reversed in the next two quarters. It envisages that this would translate into a real GDP growth rate of between 5 and 6% in 2015. Experts seem to agree that a lot depends on how helpful the military government is to the economy. As Adrian Dunn, chief executive officer of the Brooker Sukhothai Fund, said at a recent event in Bangkok, the NCPO government seems to have learned from the mistakes of the military’s ponderous approach in 2006. The last of these measures implies that the government is attempting to speed up approval of infrastructure projects and foreign investment; therefore making doing business in Thailand easier, and in some cases cheaper. “Infrastructure spending will revitalise private spending, which has significantly lagged other ASEAN countries like Indonesia and the Philippines,” explained Dunn. · Ordered a review of all infrastructure projects including those regarding high-speed rail and water management. Dunn suggested that this is feasible as he sees the government debt to GDP ratio as relatively low, in comparison with G7 countries. He added that Thailand’s economy has avoided catastrophe thanks to the coup and that if the suggested policies are indeed implemented, the country will be in a great position to further capitalise on the modernisation programmes underway in neighbouring countries (Laos, Myanmar, Vietnam and Cambodia). At the same event, I said that Thailand now faced three main challenges: addressing the political division; tackling the increasing private debt burden; and the slowing of global trade. The latter is of course outside Thailand’s hands and it is particularly precarious given its heavy dependence on the export market: over the last twenty years, Thailand’s GDP growth pattern has been almost identical to that of its export volume. With this in mind, stock valuations on the SET are not unreasonable and fundamentals, such as the baht are reasonable. That said, the country is not out of the political woods as yet; there remains the debt legacy of the previous government’s stimulus policy and that global trade could weaken or even collapse in the not-too-distant future. 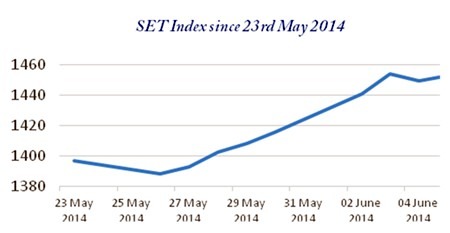 3 UBS Global Research, Asian Focus – Thailand: Post coup pent up demand, 10th June 2014. Coup d’état or Coup de Grâce?